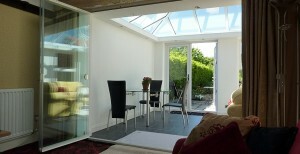 UltraSlim slide-pivot patio Doors - better than bifolding doors? Although they may look similar to bifolding doors, there are major differences between bifolds and slide-pivot (or slide & turn) doors, especially in the way they open and close. 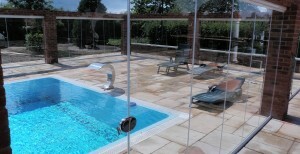 UltraSlim Doors appear to be a series of full length glass windows but with the added advantage of enabling the whole ‘wall’ of glass to slide out of the way to provide maximum walk-through access width. With excellent views, UltraSlim can enhance the pleasure of living in a beautiful location. If views are not particularly spectacular, there is the advantage of maximising natural light and the ease of a wide access between rooms or house and garden. The aluminium frames may require an occasional wipe with a damp cloth and the floor guide will need to be kept clear of fluff and grit, otherwise there is nothing to do except enjoy life with your doors! When you are deciding your door configuration, be aware that there is a master or main door – the one that you would use as a normal single door to the garden, conservatory or between rooms. This door will pivot open in one direction – just like most other standard doors. Do you want the main door on the left of your door-set or the right? If it is on the left, it will open to the left & if it is on the right, it will open to the right. Do you want the doors to open towards you or away from you? It may help to watch the live video demonstrations of slide-pivot doors (UltraSlim and Frameless Glass Doors). Alternatively, we have produced a graphic slideshow animation, below. In this example, the main door is positioned on the left and the doors open outwards. Just measure the approximate size of the aperture where you would like your doors to be fitted and submit your quotation request for UltraSlim Doors.